The Waitemata District Health Board had a requirement for a multilevel car park to support its main North Shore Hospital located on the shores of Lake Pupuke. Contech worked closely with the Head Contractor Brookfield Multiplex to develop an alternative design utilising post tensioned cast insitu floors as an alternative to conventional precast pre-stressed concrete construction. The solution proved to be highly economical and Contech was employed as a design build subcontractor. Design was performed in collaboration with MSC Consultants. This project followed a successful previous collaboration with Brookfield Multiplex on a similar car park project at Sylvia Park Shopping Centre. 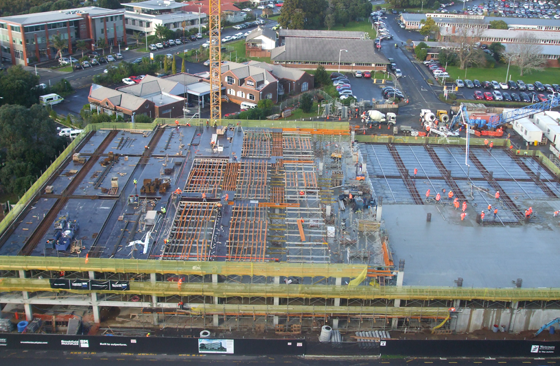 The North Shore Hospital Car Park consists of 6 levels for a total floor area of 28,000 m2 and utilising 170 Tonnes of stressing strand.